Field storage categories are the compatibility groupings used for ammunition storage in the field. Category A: Fixed and semifixed ammunition (except chemical and incendiary). Category C: Mortar ammunition and hand grenades (except chemical and incendiary). Category D: All pyrotechnics, and chemical and incendiary ammunition of all types. blasting caps, firing devices, detonating cords, and safety fuses. Category F: Rockets, rocket motors, guided missiles, and rifle grenades (except chemical). cluster bombs, fuzes, primers, and detonators. 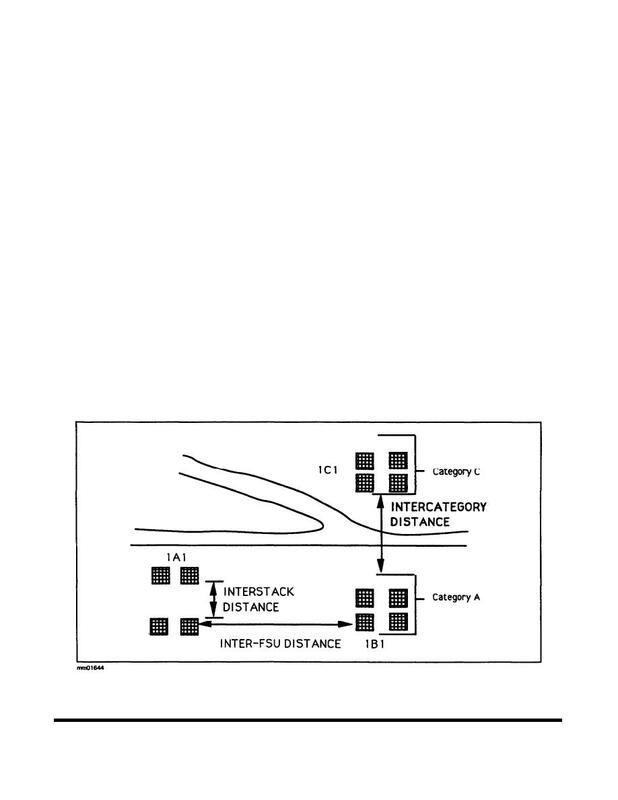 interstack, inter-FSU, and intercategory distances. These distances are illustrated in Figure 3. Figure 3. Field storage distances.